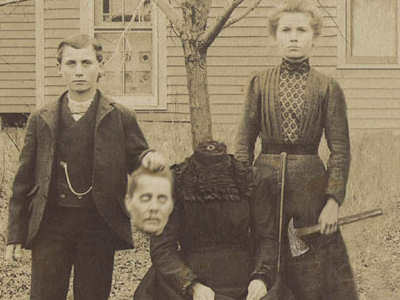 A vintage photo appears to show two children with their beheaded their mother. The photo, however, is not real. This is the Buckley Family. The children’s names were Susan and John. As a Halloween joke, all the kids in the neighborhood were going to get a dummy and pretend to chop its head off. 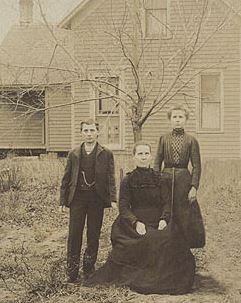 The Buckley children thought it would be hilarous to actually murder their mother, so when the kids walked up to the door, they got an axe and slaughtered her. Once everyone figured out what they had really done, they called the police, but the kids were long gone by then. The only picture of them was this photo, taken by a trick or treater. The mother’s body was later found half eaten. Although the gruesome photo and accompanying tale are shocking, neither are real. The photo above has been altered from the original, which can be seen below. I always liked this photograph and had been meaning to work with it for a while. I thought it had a really eerie atmosphere with the stark lighting, desolate landscape, and the somber expressions on the family members’ faces. Like so many photos from that era, it was rather washed out, hazy, and yellowed, but I like it that way. After all, it is supposed to look old, faded, and HAUNTED! A Google search for the altered photo shows numerous appearances throughout 2012 and 2013, which the image was most popularly shared online. The photo which appears to show two children who beheaded their mother is fake. It was altered from the original by artist Edward Allen. The scary back-story which often accompanies the image seems to have been created after the fact to enhance the effect of the fake photo. Sponsored links A highly-cited “fact” states that deaths from falling coconuts greatly outnumbers deaths by shark attacks.